Medicom boasts that this is one of the best-looking Batman figurines on the market, and we’re inclined to agree. This Batman from the acclaimed Batman: Hush comic series by Jeph Loeb and Jim Lee comes 12 inches tall and with an exquisitely tailored costume. Three sets of hands and an intricate head sculpt (an original design by Lee) showcase the craftsmanship put into the rendering. It’s even more remarkable when you realize that it’s a 3-D imagination of a 2-D character — no small feat! This could easily be one of the best Medicom figures yet. Keep it on the Hush. Wish you could own the coolest robots on the planet? Well, Thomas Bangalter and Guy-Manuel de Homem-Christo of Daft Punk are humans under those helmets so they’re not for sale, but their latest partnership with Medicom Toys can get you the next best thing. The “Random Access Memories” figures stand almost a 12 inches tall and feature both band members in their respective gold and silver helmets and gloves, with black sequined suits. They were created as a part of Medicom Toys’ “Real Action Heroes” series. You can get your favorite one or buy both. From Medicom! Based on the best-selling series Batman: Hush by Jeph Loeb and Jim Lee, Medicom continues their line of 1/6-scale Real Action Hero figures with Catwoman! Sculpted at 1/6-scale, this figures are taken from the original designs by Jim Lee, and are built using the finest craftmanship and costume tailoring. Based on the bestselling comic book series Batman: Hush by Jeph Loeb and Jim Lee, this dramatic 1:6 scale Harley Quinn Real Action Hero Action Figure is a matchless collectible for DC Comics and Jim Lee fans alike! Sculpted in plastic from an original design by Jim Lee, the huge Harley Quinn action figure was created using the finest craftsmanship and costume tailoring! Add to your DC Comics or Batman collection with this one-of-a-kind Harley Quinn Real Action Hero Action Figure from Medicom. A Japanese import by Medicom Toy Co. Japan’s acclaimed Medicom Toy Company delivers their take on Christian Bale’s Batman with this The Dark Knight Rises Miracle Action Figure. 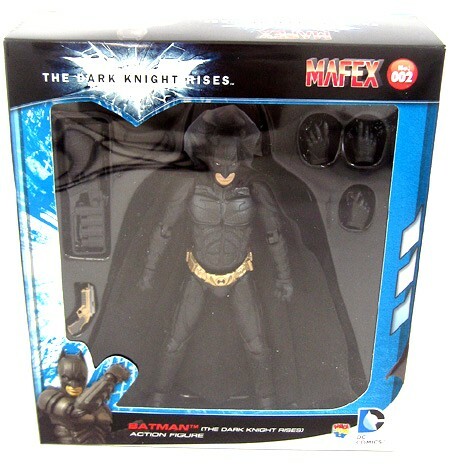 Based on Bale’s appearance in the third movie of director Christopher Nolan’s Batman trilogy, this hyper-articulated figure comes packed with multiple hands for action poses, EMP Rifle and Batgrapple. Was he ever this young? The Rolling Stones’ Keith Richards looks pretty different in this amazing figure from Medicom. Featuring his classic guitar and some truly incredible sculpting for this likeness, this “Ultra Detail Figure” is a surefire catch for anybody who wants to relive the golden years of one of the world’s greatest bands. Keef stands about 6 inches tall and would make a pretty solid addition to the line-up you know you should be building. The Joker (The Dark Knight movie): NEW DECO! NEW ACCESSORY! Batman (Batman movie 1989): NEW DECO! Harley Quinn (animated-style): NEW DECO!